When asked who is this Iswara who is explained as approachable by everyone? In this 10th pAsuram, nammAzhwAr explains thirumanthram with its meaning and thus instructs everyone to approach emperumAn. Subsequently, nammAzhwAr explains the complete nature of emperumAn being the most apt goal. In this 10th pAsuram, nammAzhwAr explains that while approaching emperumAn, meditate upon thirumanthram with its meanings. 10th pAsuram – Nice. We agree with your suggestions. What is the manthram that anchors our devotion? nammAzhwAr explains that thirumanthram (asthAksharam) is the manthram and instructs that one should meditate on the meaning of that manthram. Others (other than prapannas) use this manthram in japam, hOmam, etc., to attain their objectives. Our AchAryas knowing that “the meaning of this manthram reminds ones true nature and leads such persons who meditate on the true meanings to mOksham”, they themselves meditate upon the meanings of the same and also instruct/teach the same to the ones who approach them (for such true knowledge). Both vEdham and AzhwArs(s) realize this manthram, some times they explain the manthram and then its meaning; other times they explain the meaning of the manthram first and then the manthram itself. This is because meditating on the meaning always accompanies remembering/realizing/reciting the manthram. nammAzhwAr says in thiruvAimozhi 1.3.3 “yAvarum yAvaiyum thAnAm amaivudai nAraNan” (nArAyaNan is such that everyone and everything is a manifestation of him – i.e., everything is his body) and in thiruvAimozhi 2.7.2 “nAraNan muzhu Ezhu ulagukkum nAthan” (nArAyaNan is the lord of all of the universes). vEdham too explains similarly as in nArAyaNa sUktham “anthar bahis cha thath sarvam vyApya nArAyaNas sthitha:” (inside, outside and everywhere nArAyaNan is pervaded) and “nArAyaNa parOjyOthi:” (nArAyaNan is the supreme light). nArAyaNan is the owner of infinite jIvAthmAs who has auspicious qualities such as Anandham (bliss), etc. He has unlimited auspicious qualities. Surrender unto the firm lotus feet of that master known as nArAyaNan. Iswara is the one who owns infinite jIvAthmAs (who have auspicious qualities such as Anandham, etc.) and who has most auspicious qualities himself. Surrender unto his lotus feet which continuously protect those who surrender. 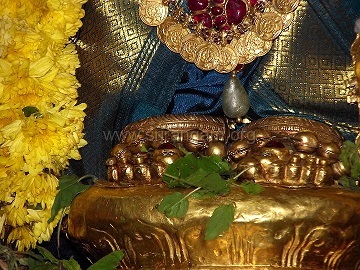 nammAzhwAr explains thirumanthram with its meaning through this pAsuram. When kUraththAzhwAn was explaining thiruvAimozhi, for this pAsuram, AzhwAn tells his two sons parAsara bhattar and srI rAma piLLai (vEdha vyAsa bhattar) “You hear the meaning of this pAsuram from your AchAryan” (as thirumanthram is traditionally explained by ones own samAsrayaNa AchArya – both bhattars are direct sishyas of embAr). When bhattars get ready to leave, AzhwAn changes his mind and tells them “We never know who will survive even for a moment. So, while you are here you listen to the meaning”, explains the meaning of thirumanthram and tells them “Remember this pAsuram as explaining thirumanthram”. oN poruL – distinct object (knowledgable object) – unlike achith (matter) which does not have knowledge, jIvAthmA (chith) knows himself through dharmi gyAnam (consciousness) and other objects through dharma bhUtha gyAnam (knowledge). IRila vaNpugazh nAraNan – countless. IRila is explained with both “oNporuL” and “vaNpuguzh“, i.e., bhagavAn having countless jIvAthmAs and countless great qualities. And this combination is the distinct quality of nArAyaNan. Having infinite eternal jIvAthmAs who are of three kinds (nithya – ever-liberated, muktha – liberated and badhdha – bound souls) and eternal auspicious qualities is the main identity for nArAyaNan. thiN kazhal sErE – Knowing that the relationship is eternal between bhagavAn and jIvAthmAs, he will never let go the ones who have clear knowledge about this eternal relationship. His lotus feet are explained as “thiN kazhal” (firm feet) to indicate that they will always protect the ones who surrender. sEr – You surrender unto him. After knowing that he is your own master, surrender immediately. This is “nama:” in thirumanthram (which explains emperumAn is the means to attain him). This entry was posted in thiruvAimozhi, thiruvAimozhi 1st centum on May 22, 2015 by Sarathy Thothathri. Thanksgiving gain more about prabanham.